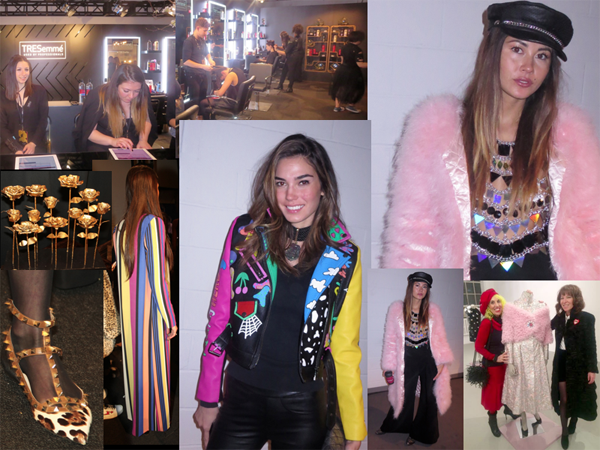 Home » Posts Tagged "Ana Tanaka"
Seen on Scene at New York Fashion Week for Fall 2017 are Top Left To Right: Taking appointments for the TRESemmé Salon at Skylight Clarkson Square … Styling the hair of the fashionable ones between shows in the TRESemme’s on-site salon … Ana Tanaka wearing Wekoko pink fur with a Claudio Pink terrific top and cap (wide pants photo under) … Middle/Bottom Rows: Gold flower sculpture from Badgley Mischka’s new Home Collection … Valentino shoe on Badgley Mischka Fashion Designer McCrea Davison …Long striped coat from a Resort/Cruise Collection on Melissa, Sr. Badgley Mischka Sportswear Designer … Rachell Vallori, Cuban model and actress, wearing a wonderful Wekoko jacket … Carole Garber of the yellow hair with Fashion Designer Anna Tagliabue and pink PelushNYC Faux Fur and brocade dress at her Caelum Gallery Presentation. Carole is wearing a red skirt by Giambattista Valli, red hat by Mogwall, Vivienne Westwood sweater, Yves Saint Laurent boots, H&M black top, Sputnick style Neoporene bag by Neo, all jewelry – necklace, bracelets, earrings by Carole Garber Accessories. Hair color, worn almost 10 years, by A. J. Lordet, Pierre Michel.